4.0 out of 5 based on 46 bloggers and 7 commenters. 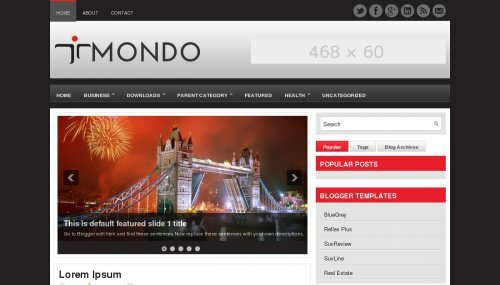 Mondo is a free blogger template adapted from WordPress with 2 columns, right sidebar, ads ready, footer columns, slider, social bookmarking icons, posts thumbnails, tabs and drop down menu. If you expand a template from 960 to 1200px, what do you do so the top social goes where it’s supose to? I am having trouble with the Tabs on the template without a slider. It is not functioning at all. The content of the three tabs is being displayed as three normal widgets without their function (view) being linked to the corresponding tabs. The slider template tabs work correctly so i know their is a problem with the coding in the template without the slider that is included in the download. I would love to use the template with no slider as well on a sub-domain but without the tabs working – I can’t. My message has been edited. I would like to know how I can either shorten the preview of my posts as it pretty much shows up all of my post, or even remove the “read more” option please. whats going on this templet……. why photo slider is not sliding……. Hy… My slide is not working on this temp…. Please tell me how I can…. In this template there is a very big problem with comment reply. Reply button doesn’t work.